Crosslake is a rural town some refer to as “God’s Country” because it is in northern Minnesota’s breathtaking lake region. It is here, deep in the pristine woods, that a project called the “New Noah Project” was born out of a spiritually based appreciation of and responsibility for care of Creation. The project has had several key components that make it not only a model for members and the community, but for the Presbyterian denomination and nation as a whole. 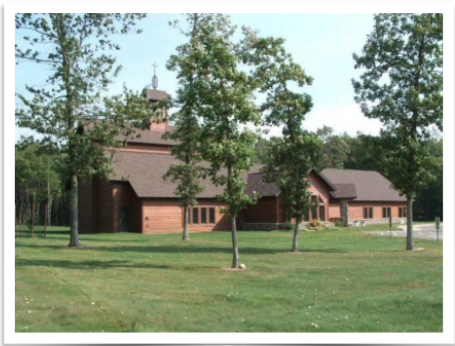 It started with constructing the new church itself, using sustainable methods, including geothermal heating and cooling, energy efficient windows, doors, lighting, and insulation. In 2013, solar panels were added to provide a considerable portion of the church’s electrical needs. Whatever the sun cannot provide they make up with the purchase of wind generated electricity units. In addition, they maintain a ten acre parcel of forest that propels the project over the top and into a negative carbon footprint of 110% carbon reduction equivalent of what they would have been consuming if traditional building practices and fossil fuels had been used. The church recently completed a study analyzing the building’s past and future performance and is dedicated to its green mission. To extend its mission even farther, it seeks to triple its photovoltaic system, with the church applying the dollar value of electricity produced to the purchase of solar hot air furnaces for Habitat for Humanity homes. This will avoid carbon pollution from energy production twice, and reduce utility bills for low income families.